How Much is Inside a Jar of Mustard? 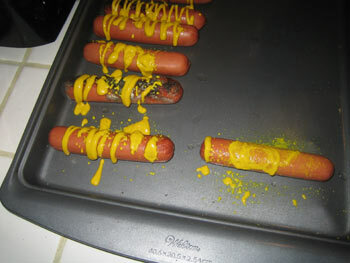 How many hot dogs can you decorate with a single bottle of mustard? How much is inside Mustard? A staple of summertime living, French's classic yellow mustard is the only suitable companion to hot dogs. However, while other websites delve into the buns 8-pack vs. frank 10-pack controversy, here at How Much is Inside, we wondered, how many hot dogs can you dress with one bottle of Mustard? On Friday night, we decided to find out. 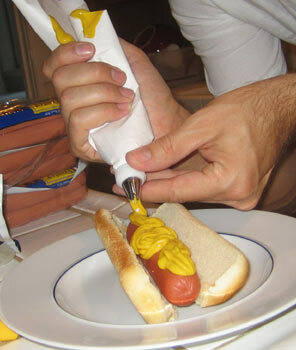 In the U.S., mustard is applied to hot dogs with a squeeze bottle, using an aggressive zig-zag motion. That is the way we decided to try it. In Germany, mustard is dipped with a spoon from a jar. In Japan, 10cm of mustard is squeezed out in a perfect line along the bridge of the wiener. In France, mustard is piped onto the dog with a pastry bag. In Australia, the hot dog is replaced by a cold pint of beer, and the mustard is left off altogether. In the game Clue, Colonel Mustard in the kitchen with the candlestick. A few phone calls to friends, and a quick trip to Costco and we were ready to barbeque some dogs. 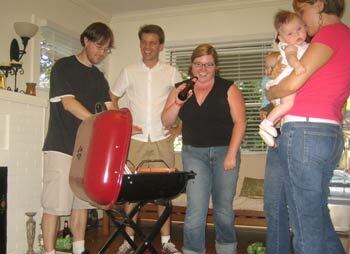 The heat outside was becoming unbearable, so we set the grill up in our living room and fired up the briquettes. Boy! Was that a huge mistake! The room got so smoky, it masked the subtle bouquet of our $3 cigars! With Eric's help, the grilling operation was moved outside. 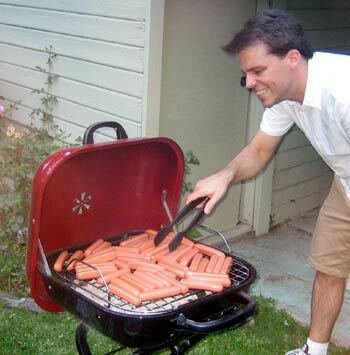 You should have seen Tom's face when I put 47 hot dogs onto the grill at the same time. He was concerned that I wouldn't be able to keep them all turning fast enough over the hot coals. His fears proved unfounded, however, thanks to my honed LAN-party reflexes and short-order cooking experience at the circus. The tongs were a blur and not one hot dog was burned beyond being edible. As the dogs came off the grill, we began lining them up on the table in the breakfast nook. We really didn't have any idea how many hot dogs one bottle of mustard could dress. We certainly didn't want to run out of hot dogs before we ran out of mustard. At 8:30, after a good shake, Jane opened a new 14 ounce bottle of French's Classic Yellow mustard and began squeezing it onto the dogs. 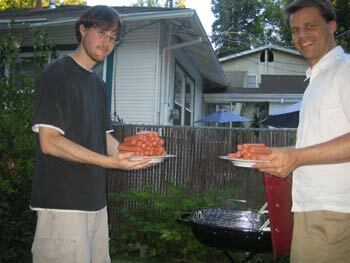 We had also grill-toasted the hot dog buns. Hot dog buns are created with an ultra-delicate dough-hinge that has a 70-80% chance of pre-ingestion failure. Even the engineers at the taco shell factory laugh at the hot dog bun. We reinforced our buns with duct tape. We did the same with the hot dog buns. 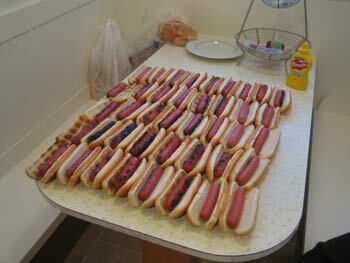 Jane zigzagged a little mustard along each dog, methodically making her way through 20, 30 even 40 hot dogs. Professional mustardors charge up to $60 per hour for this service at the ballpark, but Jane was volunteering her time here in the breakfast nook. 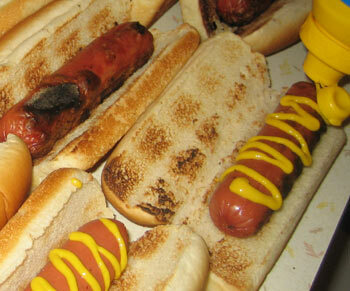 Even after 4 dozen hot dogs, the sturdy nozzle provided professional results. Jane and I were actually set to perform this experiment with Dave Grohl of the Foo Fighters on the MTV2 set of 24 hours of Foo. However, the experimental wieners had been double-booked in a hot dog eating contest, and the mustard test was shelved. 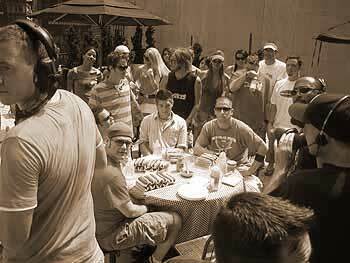 Here is a sepia-toned olde tyme image of that historical day. The afternoon wore on, and Jane continued shaking and squeezing. After months of waiting, we were close to finally having our answer! 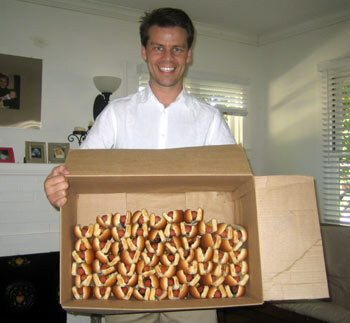 As the number of mustarded dogs passed 70, we reached the end of our hot dog buns! Damn!! I immediately broke into open sobbing, but Jane soldiered on, moving to our reserve sheet of pre-bun dogs. 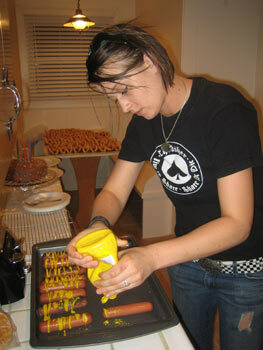 With a Jim Carrey soundtrack, the mustard bottle gave its final spray of wiener icing. The task was finished and we had an answer! 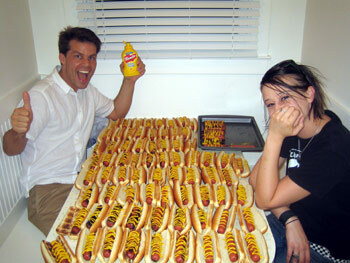 The bottle of mustard was enough for 80 hot dogs! Hooray! That is an average of 5 grams of mustard per hot dog. By the end of the experiment, Everyone was starving for hot dogs! They smelled delicious. As it turned out, everyone liked their hot dogs prepared a little differently, so they each required a personal touch before they made it into our stomachs. Eric added sweet relish, Meghan made hers into a little sandwich. Stacy rinsed her hot dog carefully to remove impurities, and I ate mine without the peel. Hot dogs, hot dogs, hot dogs! Is there a finer food on the planet?! 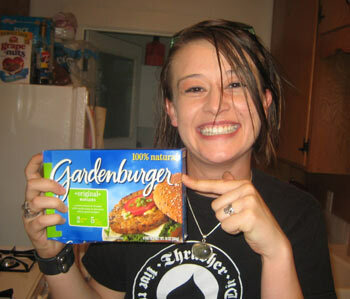 Jane had her own idea for dinner: Gardenburgers. I wonder if she knows what they put in those things! We ate our fill of hot dogs, but there were still dozens of them left over. Unsure what to do with them, I boxed them up and waited for inspiration to strike. Within two weeks, I had an idea! I decided ship them to San Francisco's SBC ballpark, where hot dogs are priced at a premium. At the ballpark, these 64 hot dogs would sell for $288. I hope they like mustard!